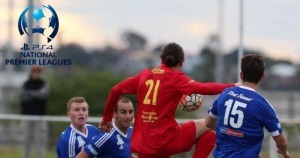 Broadmeadow put a dent in Hamilton’s minor premiership ambitions in an enthralling clash at Magic Park in the Match of the Round of the PlayStation® 4 NPL Northern NSW on Sunday. In one of the matches of the season where both sides put everything on the line, a point a piece was the end result from a clash which kept everyone on the ground on the edges of their seats. Hamilton dominated the opening 20 minutes of the derby and it was Olympic’s Daniel Bird who got the scoring underway in the 15th minute. Kane Goodchild played a ball to the unmarked winger on the left side of the box who hit a left foot shot across a diving Nick Hartnett and into the bottom right corner. Hartnett would have felt he could have done better as Bird’s shot lacked power, but the shot was well placed. But, after the opening 25 minutes Olympic sat back and invited pressure from the home side and Broadmeadow pounced with James Virgili finding Kale Bradbury at an acute angle from goal on the right. Bradbury spun and struck his right foot shot across Danny Ireland and into the left side of the Hamilton goal. Magic had a penalty shout waved away moments before the break when Virgili was collected by Olympic keeper Danny Ireland when he chased a chipped pass into the box. It soon got worse for the home side right on half-time when Virgili fell awkwardly in the box and dislocated his left shoulder. The NPL Northern NSW’s leading scorer when the hospital for an X-ray and didn’t return for the second half. Hamilton had the better of the chances in the second half, as Kane Goodchild missed two chances he will want to forget. The first from just inside the eighteen-yard box one-on-one with Nick Hartnett and the second when he blazed over the bar when he was unmarked at the back post following a Leo Bertos cross. Both sides also had claims for a penalty and a red card in the second stanza, first when Olympic’s Grant Brown fouled Kale Bradbury as the last man, and then a minute later Rhys Cooper was brought down on the edge of the eighteen. Jacob Bailey then hit the bar in the final minutes of regulation time, before Broadmeadow broke and Kale Bradbury thundered his left foot shot into the underside of the crossbar. The rebound fell for Peter Haynes and his shot was brilliantly saved by Danny Ireland who was moving to the left and dove back to the right to tap it over for a corner. Hamilton coach Mick Bolch thought it was an ‘entertaining match for the crowd’ but believed his side’s finishing could have been more clinical. In round 16, Hamilton host the Jets Youth at Darling Street, while Broadmeadow face a trip to Valentine to meet the Phoenix. Charlestown kept their faint hopes of a finals birth alive with a 3-2 win against the Bears at Rockwell Automation Park on Sunday afternoon. The Blues now sit four points behind fourth-placed Maitland who have a game in hand against the Jets Youth. The Blues opened the scoring when Dan Laiman ran down the left edge of the box and played a pass inside to Rene Ferguson who flicked his pass to Cameron Sullini who tapped his shot past Benn Kelly in the Weston goal from the six-yard box. Weston were quick to reply though when Rob McBeth received a throw inside the box turned and played a pass across goal to Jake Barner who tapped from inside the six-yard box past Nathan Archbold to level up the scores. It didn’t take long though for Charlestown to hit the lead again, as just eight minutes later Jarryd Johnson played a pinpoint pass from the right side of the field on halfway to a running Rene Ferguson who stepped away from Nathan Morris and headed the ball off the bounce over an onrushing Benn Kelly and into the Weston goal. Down 2-1 at the break, the Blues were first to score in the second when Scott Smith headed in a cross from Sullini to score his 5th goal of 2016. Jake Barner then grabbed his second of the afternoon late in stoppage time when Nathan Morris chipped a long pass to Garry McDermott down the right side. McDermott crossed onto the head of Barner who nodded in for his second. Weston coach Trevor Morris described the match as ‘groundhog day’ once again for the hapless Bears. Next weekend the Bears meet Maitland in the Coalfields Derby at Cooks Square Park while Charlestown host Edgeworth at Lisle Carr Oval. The Jets Youth side bounced back from a record defeat in round 15 of the PlayStation 4 NPL Northern NSW to account for the Adamstown Rosebud at Adamstown Oval in round 16. Krisitan Brymora, Finn Paris, Cody Carroll and Cameron Joice all got on the scoresheet for the Young Jets in an impressive performance. Krisitan Brymora scored his fourth goal against Adamstown in the 20th minute to open the scoring for the Jets Youth. Tom Waller found him on the edge of the eighteen and Brymora did the rest, dancing his way past a couple of defenders and firing his right foot shot past Paul Bitz’s outstretched glove and into the bottom right corner. The Jets grabbed their second less than three minutes later when Alex Read passed back to Jordan Harrison who was on the halfway line for the Rosebuds. Harrison slipped over and allowed Finn Parris to race down the left side of the ground to the eighteen-yard box before playing a ball over to the right to Krisitan Brymora. Brymora summed up the situation and crossed back to Parris who tapped in at the back post for a 2-0 lead. But, Adamstown were soon back in the match in the 33rd minute though when a Chris Berlin corner fell to an unmarked Thom Lino on the edge of the six-yard box who scrambled it past Pierce Clark in the Jets Youth goal to get the Rosebuds back into the match. A tight next 40 minute ensued, with the Jets Youth striking the hammer blow 14 minutes from full time when Tom Waller’s cross on his right bottom from the left edge of the box was headed by Brymora onto the crossbar. The ball bounced favourably off the bar to Cody Carroll who headed home from less than a metre out. The Jets Youth were quick to put in their fourth, when Brymora controlled a cross from the central long pass from the left edge, and played in an unmarked Cameron Joice on the right who calmly slotted his right foot shot across Bitz and into the bottom left corner. Adamstown coach Graham Law gave full credit to the young Jets. Law though was disappointed with his sides ball movement. The Jets Youth meet Hamilton Olympic in the Match of the Round next weekend while Adamstown play host to the Lambton Jaffas. The Lambton Jaffas’ season from hell in the NPL Northern NSW continued on Saturday, as Maitland got their first win against the Jaffas since promotion to the top grade at the end of 2014. The win consolidated Maitland’s place in the top four and it looks likely that the Magpies will be playing finals in just their second year in the NPL. However, it was the Jaffas who would score first through a gift from Maitland’s defender and Captain Blake Thompson. Lambton’s Ben Hay put a low cross in from the left side and Thompson shanked his right-footed clearance perfectly into the top left corner of Matt Trott’s goal. Maitland replied quickly though when Matt Thompson headed home from close range to lock things up. Less than five minutes later and the Magpies had the lead, as Carl Thornton went from a weaving run which started inside his own half and ended on the edge of the eighteen when he hit a superb strike into the top right-hand corner of Lambton’s goal. Lambton’s afternoon got even worse when Ryan Broadley found Matt Thompson at the near post when he whipped in a cross from the left side, as the visitors led 3-1 at the break. The Jaffas had their chances in the second half, with Matt Trott making two fine saves, the first from a Pat Brown shot which looked destined for the top corner and the second from a John Majurovski penalty where he dove low to his left. Before the Magpies put an exclamation mark on their performance when Matt Thompson chipped Brad Swancott from the left corner of the box to make it 4-1. Jaffas coach James Pascoe thought his side started the game well and praised the performance of Matt Thompson. Pascoe though took some positives out of the second half performance. Next weekend Lambton travels to Adamstown to meet the Rosebuds while Maitland meet Weston in the Coalfields derby.